Although they've been around since 2009, due to a myriad of label issues and lineup changes, Young Buffalo didn't release their debut LP, House, until March of this year. 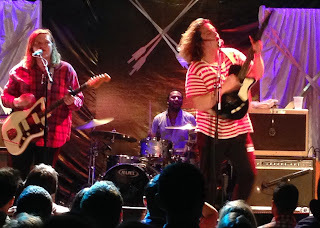 A history as such could understandably wear down on a band, but last night at the Bowery Ballroom, Young Buffalo played with all the excitement of a brand new group, performing the House tunes with vigor and upping the tempo of their older songs. Taking the stage to the swirling synths of St. Lucia's "The Night Comes Again," the band replaced those keyboard sounds with a few of their own, Will Eubanks sweeping into "Man in Your Dreams." The small crowd gently nodded their heads as Jim Barrett sang the first verse, still unsure as to their opinions of the opening act. You could feel the change in the room when Ben Yarbrough and Tim Burkhead joined Barrett in beatific harmony for the song's pre-chorus. With the audience hooked, it was time to have some fun. Jim put down his guitar to dance around the stage while singing "Nature Boy," the arrows in Matt Pond PA's backdrop sporadically providing a Steve Martin effect. "Guilt" began with a gentle bassline from Andrew Guinn before evolving into a full-on rocker. Following a Yarbrough-helmed "Cliff Diver," the boys powered into their rumbling single "Sykia," the room now mobbed with engaged listeners. As Burkhead pounded his kit at the song's end, two girls behind me started singing "hey!" noting its similarity to Gary Glitter's "Rock & Roll, pt. 2." It was tolerable at first, but wore thin when they continued doing it as the band broke into "My Place," their softest number of the night. Barrett and Guinn traded instruments for the nearly-prog "Old Soul," and switched back for a frenetic "No Idea" that climbed "Upstairs" to finish off the set. We can only hope that Young Buffalo will visit us again this summer, and maybe they'll even pack a "Pill" and some "Summertime Blondes" along with them. I had drinks with Jim and Ben before the show, so stay tuned in the next couple weeks for a new episode of The Next Round with Young Buffalo.